The international organization of women pilots. The 99s promote advancement of aviation through education, scholarships and mutual support, while honoring our unique history and sharing our passion for flight. Through our chapters, we are involved in air marking, flying companion seminars, aviation programs for young girls, and more. The next time you go flying, look down at the airport and the surrounding buildings. 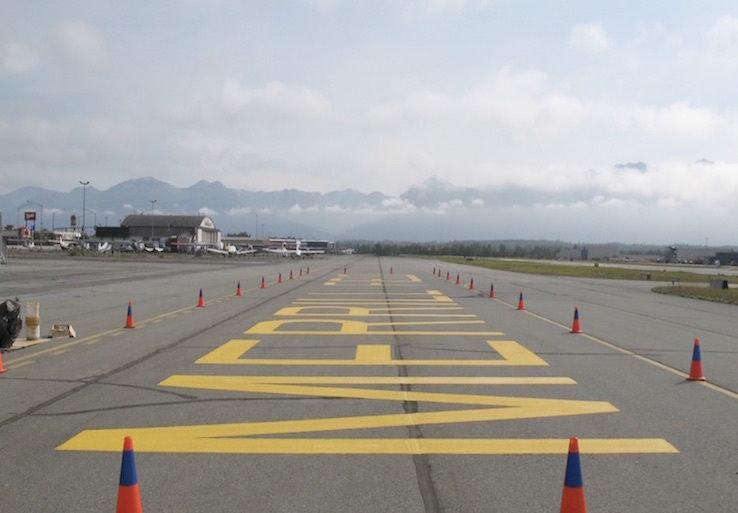 You may notice markings pointing to the airport and will probably see the airport name painted on the field. 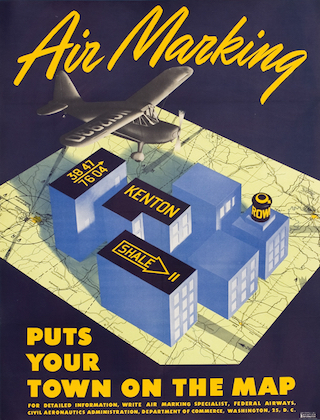 This program of identifying airports to pilots was started as the National Air Marking Program. This program was the first U.S. government program conceived, planned and directed by a woman with an all-woman staff. Imagine flying your biplane over those small towns in the 1930s and how comforting it must have been to see that runway or rooftop with your destination's name clearly painted on it. For that you could thank early members of The Ninety-Nines for leading the way in the air marking efforts of the 20th century. Funding for the air marking program no longer comes from the national government. Today, the 99s, International Organization of Women Pilots, continues the tradition of air marking as a way to share their love of aviation, provide fellowship among the aviation community, and continue the passion for flying while preserving the history of women in aviation. 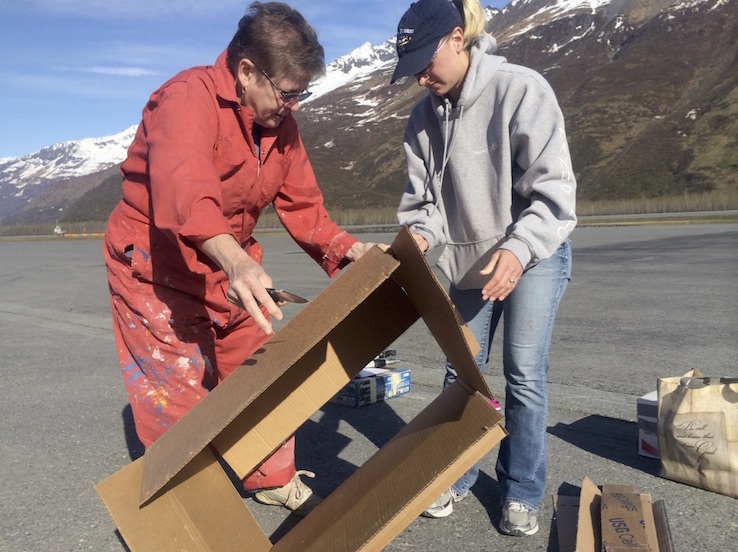 99s members volunteer their time to paint compass roses, airport names and CTAFs, tetrahedrons, and other identifications on and off airports—even rocks marking backcountry airstrips—based on the needs of the airport community. "We toiled and carefully removed the tape, with only a few slight bobbles to be corrected, but it looked GREAT!!!" "For as tired as we were, and knowing the pain our bodies would suffer afterwards, we couldn't help but feel proud of our new creation! What a wonderful feeling of accomplishment, knowing you are contributing to making something that will stand the test of time! 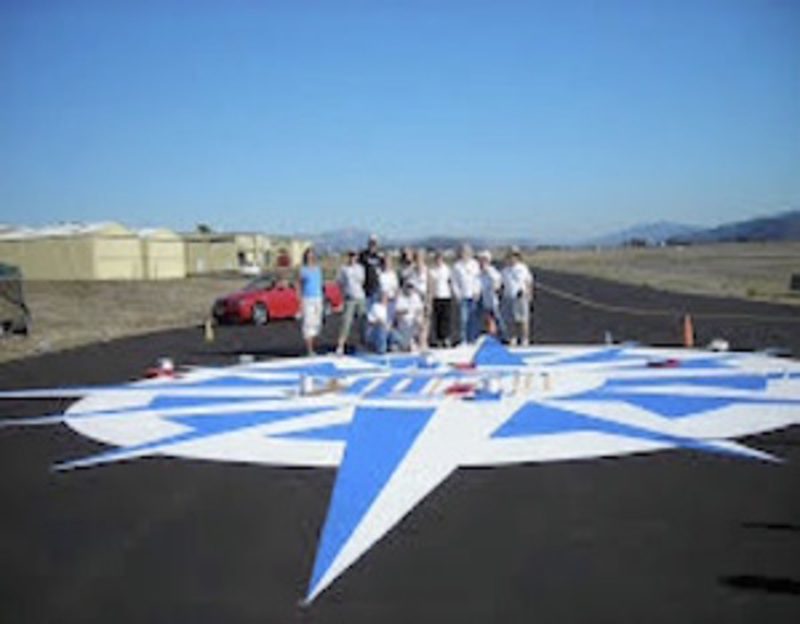 That compass rose was beautiful, and we were all happy to have made the effort to create it!" "For all the work it was, I will be happy to do it again and again, as I've never felt such a great feeling looking at it afterward. All I wanted to do was hop into a plane and see it from above." "I can't tell you what a worthwhile effort this is, for the sense of accomplishment and pride it leaves behind in all of us who worked on it." 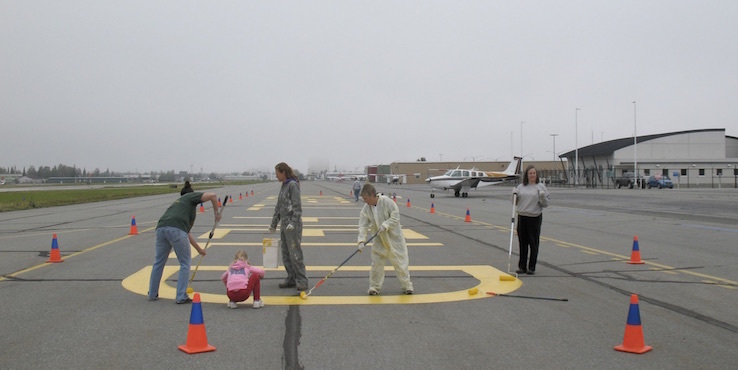 Photos: the air marking of Merrill Field in Anchorage; Patty Livingston and crew air marking the Valdez airport. How to Participate With Your Chapter! 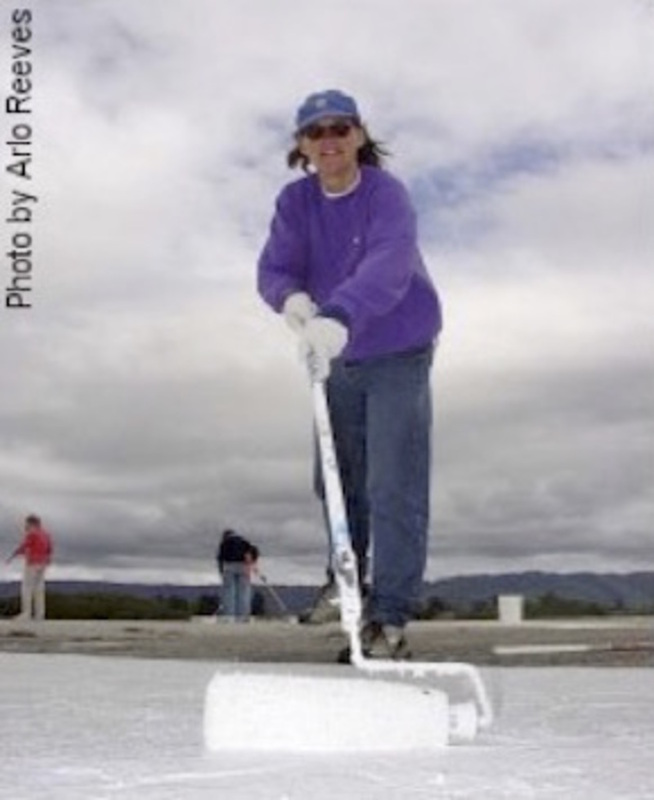 As a charitable organization we ask that airport management provide the necessary paint and tools. We supply the womanpower, often with assistance from our 49-and-a-halfs and local pilots, CAP or ROTC cadets, and Girl or Boy Scouts. 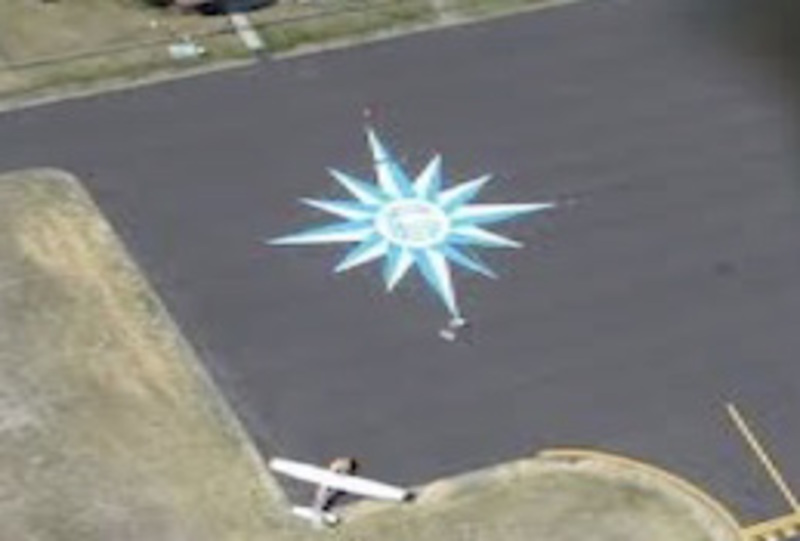 For a compass rose, the airport authority is responsible for the survey needed to establish magnetic north. We have an air marking manual outlining procedures, tips on what works well and what doesn't, along with diagrams and layouts for compass roses. So, organize your group, plan your day, and let's put our air marking projects on Google Earth! 99s Fly! Blog Newsletter Events Calendar Member Resources Join Us!